Feast your eyes on the Lush Brushed Steel Bar Stool Purple, a modern wonder with a real statement look. Luxuriously designed with plenty of charming characteristics, the Lush Brushed is a vibrant piece of furniture that will bring your interior to life. Sure to catch the eye, its funky purple faux leather upholstery is inlaid with neat horizontal stitching. 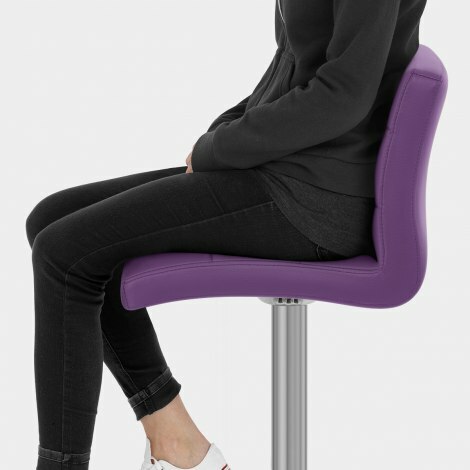 Padded for comfort, the supportive seat and high backrest invite you to sit back and relax. All supported by a single stem frame with an elegant brushed steel finish, a chic rectangular footrest makes a practical addition. Also adding to its first rate functionality is 360 swivel capabilities, along with a gas lift mechanism for adjustable height. Set on a round base with a protective rubber underside, the Lush is a fashionably formed design that would make the perfect purchase. "Quality is second to none, the colour is great"
Extremely pleased with our new bar stools - perfect finishing touch to our new kitchen. Thick padded stool, sturdy, comfortable, great colour and well packaged for delivery. Really great quality chairs, nice and heavy with plenty of padding.